In my previous two posts I presented two works of art, one by Homer and the other by Michelangelo. 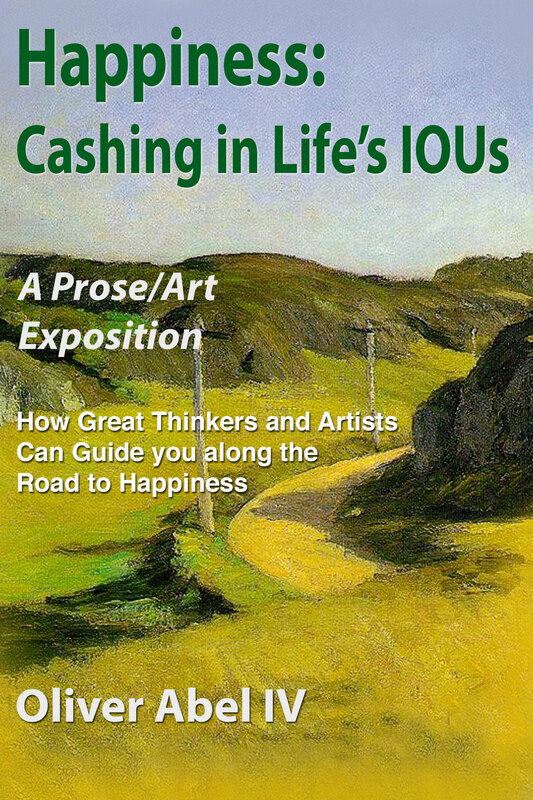 The first work expresses the virtues of wisdom and courage needed to recognize one’s purpose in life (or calling) and the courage to begin the Adventure to complete one’s calling and find happiness. The second work expresses the virtue of moderation and temperance to resist the many temptations of greed, power, and fame. This virtue, along with the preparation needed to fight the many battles of the Adventure earned during one’s Journey, allows the individual to secure the boon or gift of one’s calling and begin the return back to the everyday world of one’s family and society. One final virtue is needed to complete the adventure and approach the threshold of happiness – justice. This virtue, while concerned with the rights and obligations of individuals to others in one’s community, is more about the concern for the flourishing of one’s family, friends, and society. It is the virtue allowing the individual to ignore the temptation to remain in the Adventure forever, and not be subject to being misunderstood or unappreciated by one’s family and community for the adventure undertaken. 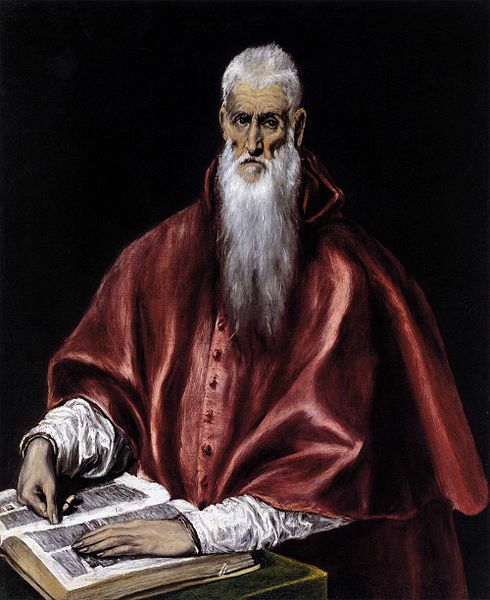 The following painting, St. Jerome, by El Greco, illustrates a lone man, exhibiting the virtue of justice, willing to share his life’s work of translating the Bible from Greek to Latin. The risk that is seen in his appearance is one of possibly being unappreciated or misunderstood. He is willing to share his life work (his calling) with those around him, but he is uncertain as to whether his efforts will be appreciated. His work is complete, the boon of his adventure has been secured through the exercise of the previous virtues, and his translation of the bible awaits those of his society. St. Jerome was responsible for the Vulgate: a fourth century Latin translation of the Bible represented by the large volume upon which rest his hands. The Catholic Church adopted the Vulgate as the official version of the Bible in the 16th century. The painter removes his figure from any specific setting, with St. Jerome depicted as an ascetic scholar with an inner vision. The figure seems to pause as if contemplating whether future readers will understand his 30 years of hard work to seize the boon, which was his translation of the Bible into the most widespread language of its time. The figure appears to need the appreciation and understanding by society for his work before he can rest in happiness. The four virtues take us along the Adventure to the threshold of happiness. However, there is still one remaining need that must be satisfied before happiness can be attained. This final need is outside of the power of the individual. This final requirement, which is crucial for meeting Maslow’s self-actualization need, must be obtained in order for happiness to be realized and in which there are no further needs or desires in life. In fact, this final requirement is needed if society is to flourish. This entry was posted in Uncategorized and tagged El Greco, justice on June 12, 2015 by oliver. In my book I mention that there is very little that modern philosophers can add to the discussion regarding how best to reach happiness in this life that the ancient philosophers haven’t already explored. I would like to discuss this conclusion of mine in greater detail in a few upcoming posts. These next posts might help put in perspective the more modern philosophers and how similar they are to the ancient philosophers. The first philosopher (who is the last of the ancient philosophers that I will mention) to break from the Aristotelian/Aquinas approach to happiness was John Duns Scotus (1266-1308), a contemporary of Aquinas. Scotus disagreed with the other ancient philosophers that happiness is the sole goal of our actions. Instead, Scotus stated that in addition to seeking happiness, individuals also seek justice. Justice is a natural tendency to obey moral laws and that these moral laws may not necessarily lead to individual happiness. As such, individuals must weigh the demands for individual happiness with a call for justice towards others. Scotus was as concerned with the flourishing of others as with the flourishing of oneself. This concern for the welfare of others is captured in the narrative of my book. As discussed in the book, the goal of the Adventure undertaken by some individuals is to capture a boon or gift for society. However, this gift can only be delivered if the individual possesses the virtue of justice (concern for others), among other virtues, and if there is a love of the adventurer by society (Aquinas requirement). Moreover, to even begin the Adventure to capture to boon requires a transcendental call or summons to the Adventure. As such, Scotus’ concern for justice, or the flourishing of others, which is an important consideration, is captured in my book’s narrative. It is the Adventure, if successful, that not only delivers happiness to the individual but also adds to the flourishing of the adventurer’s family, community, or society. This entry was posted in Key Ancient Philosophers and tagged duns scotus, happiness, justice on February 13, 2015 by oliver. Continuing from my last post: those individuals that have the virtues of wisdom and courage to recognize and accept the adventure, the moderation to avoid temptations and proper training and preparation to withstand the forces to secure the boon during the adventure, must still possess the fourth virtue of justice. As Campbell teaches, the individual existing within the adventure is usually reluctant to leave the adventure: the main reason is the risk that his/her quest or the boon captured may not be understood by society, and all the effort of the adventure was in vain. To overcome this reluctance to cross back to the everyday world with the boon intact, the virtue of justice is needed. This virtue is not so much a concern for the rights of others but a genuine concern for the welfare of the community. It is this concern that drives the individual, with the boon intact, to the threshold of the return to the everyday world. We all know of people that have left the everyday world for the adventure to never return back to the everyday world. They have not been defeated or tempted with power or wealth so that they are driven back to the everyday world. If that were the case, they would be recognized. They are those who never found the fourth virtue of justice – a concern for the welfare of others – remaining afraid of the return back to the everyday world. They simply lived the life of the adventure, again never finding happiness. This entry was posted in Uncategorized and tagged Adventure, Campbell, fulfillment, happiness, justice, Virtue on October 15, 2013 by oliver.